Photo by La Pomme de Portland, who featured my recipe on her lovely blog. Here’s one of my favorite 30-minute weeknight meals. First, I’ll give you the menu; then, I’ll show you how it can truly be done in 30 minutes. • Crêpes or Chocolate Cherry Pound Cake Bonne Femme. Or, do what most French women would do: Pick something up from a bakery! A beautiful dessert is easy when you have this beauty stashed in the freezer. Photo by Richard Swearinger. 1. 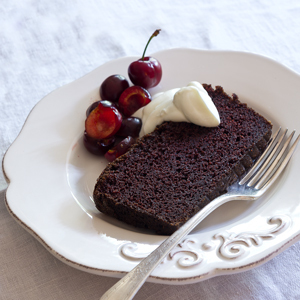 First of all, you have a great dessert stashed in the freezer, such as Crêpes or Chocolate-Cherry Pound Cake. These two desserts freeze admirably well. If they’re frozen, get them thawing. If you haven’t thought ahead, just pick up something from your favorite pastry-shop (after all, that’s what a French women would do!). 2. Measure and prep all the ingredients ready for the Chicken Francese. 3. Start the Any-Night Baked Rice. Slide it into the oven. Prep the green beans; keep them warm. 4. 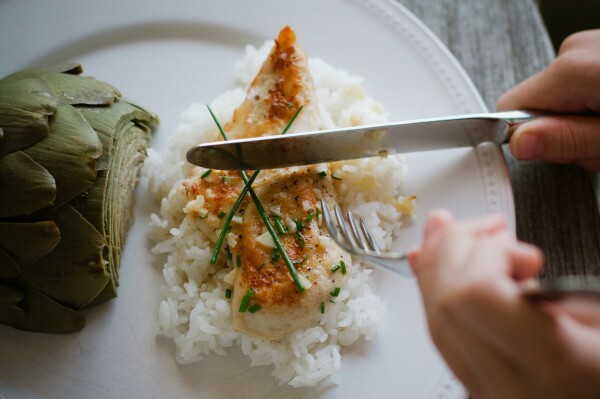 Make the Chicken Francese, which will take you about as much time as it takes the rice to cook. (If the chicken takes longer, don’t worry—the finished rice keeps well for up to 30 minutes in a warm place). Enjoy dinner, then bring out a crêpe sauced your favorite way (I give suggestions with the recipe).Or bring out the pound cake. Wine Pairing: I like a lemony Pinot Grigio with this. Murphy-Goode Pinot Grigio ($12.50) is made in a nice, crisp-lemony style.